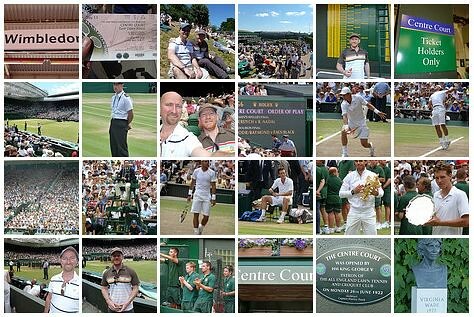 Stuart very kindly bought me two tickets to go to Wimbledon Men's Final Day last Sunday. Centre Court no less. And brilliant court-side seats (Block 101, row D). Just perfect. As Stu himself doesn't really like the tennis I took Mark (who's a big fan). We had a smashing (sic) time; the sun was shining, we had a picnic on the lawn and the tennis was excellent.